Travel by rail on the Indian Pacific between Sydney, Adelaide and Perth and you will embark on one of the worlds great train journeys. This transcontinental adventure on the Indian Pacific offers an unsurpassed view of Australia over three nights and four unforgettable days.  Named after the two oceans that it travels between, the Indian Pacific will take you from one edge of this continent to the other, East to West (or vice versa) across the Blue Mountains and the vast Nullabor. The Indian Pacific delivers so much more than an extended train ride. It promises access to parts of Australia no other holiday can come close to, the perfect balance of comfort and adventure culminating in an experience that will move you in every sense of the word.